Skip the crowds at Mailbox and check out the new Granite Creek Trailhead. King County Parks is sticking to our promise to complete 11 new trailheads by 2019 thanks to the 2014- 19 King County Parks, Trails, and Open Space Replacement Levy. On Saturday, King County Parks joined Mountains to Sound Greenway for National Public Lands Day to celebrate the opening of the Middle Fork Snoqualmie Road. 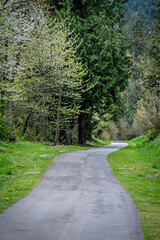 The newly paved road opens up access to many trailheads that lead to the Middle Fork Snoqualmie River Valley, one of which is the Granite Creek Trailhead. Where exactly is this new, magical trailhead you might ask? Well, it’s actually just five minutes down the Middle Fork Snoqualmie Road from the turnoff to the popular Mailbox Peak Trailhead. In partnership with Washington Department of Natural Resources and Mountains to Sound Greenway, a new parking lot with 43 spaces and new vault toilets was constructed to ease the impending vehicle congestion. From the parking lot, hikers can set out on the connector trail which links up with the existing Granite Lakes Trail. The trail continues up along Granite Creek to the culminating two lakes. Roundtrip, the hike is approximately nine miles long. Experienced backcountry travelers can venture well beyond Granite Lakes, including trails within the federally managed Alpine Lakes Wilderness Area. Funding for the new trailhead came from the Washington state capital budget, a Non-highway and Off-Road Vehicle Activities program grant award from the Washington State Recreation and Conservation Office, and the King County Parks, Trails and Open Space Replacement Levy. For more information on the project, check out the press release. Next Post Your Big Backyard is covered with these!